A magnificent 19th century French Louis XV marquetry antique bonheur du jour in the manner of Sormani, makes me long for a bay window in my bedroom, somewhere that I might set up with pen and paper (or ipad) and deal with the tasks of the day. Our latest restoration, a magnificent 19th century French Louis XV marquetry antique bonheur du jour in the manner of Sormani, makes me long for a bay window in my bedroom, somewhere that I might set up with pen and paper (or ipad) and deal with the tasks of the day. Of course once upon a time it would have been the lady of the house seated during the late afternoon, in her corseted long dress with ruffles and bustles, at her very dainty Bonheur du jour penning a letter to her husband, sister or friend. Oh to know what conversations and letters it might have been witness to. 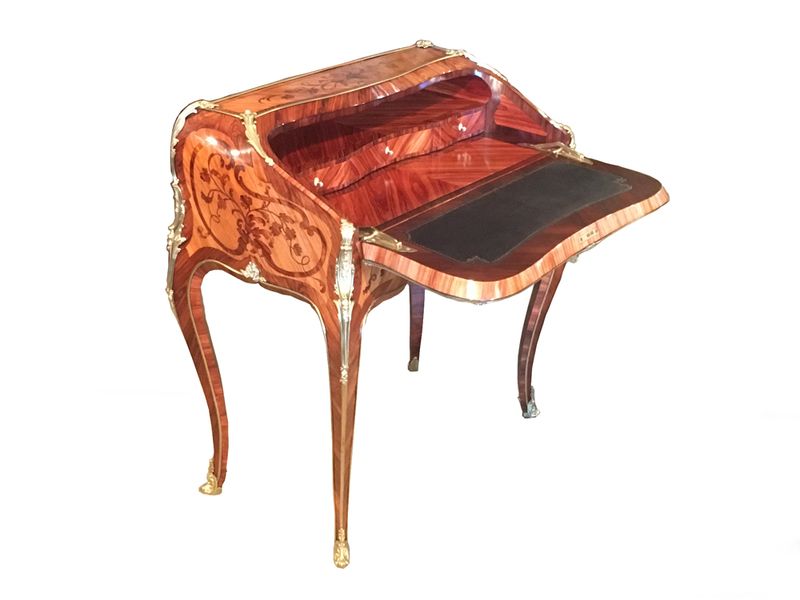 This beautiful and delicate fall-fronted writing desk certainly conjures up images of by gone eras. Never-the-less having stood the test of time, it would make a magnificent feature piece in any home today. A work of art in itself, it would make a beautiful ‘sculpture’ or functional table in a graceful entry or a writing table in a classical living room or bedroom. Freestanding and decorated on all four sides in fine floral marquetry and high quality ormolu, the fall opens to reveal the most delightful interior. The fitted compartment houses a leathered writing surface and mahogany lined serpentine drawers veneered with tulipwood. On closer inspection one finds a cleverly disguised slide, which hides a velvet lined storage well and may once have held all manner of secrets. The antique bonheur du jour is flanked by bombe shaped cross-banded sides and is supported on fine cabriole legs. In the manner of Paul Sormani (one of the most important Master Cabinetmakers of the 19th century), this piece was an unexpected recent addition to our collection. Left untouched for years, it was such a little beauty, we couldn’t bear to put it on show in its neglected state, so scheduled it into our restoration room for some TLC by our resident long standing restorer, now with us for over 33 years. To say we were thrilled with results would be an understatement. With the dirt and grime cleaned away, the full extent of the marquetry inlays can be seen and the ormolu mounts now gleam as they once used did. Of particular interest was the workmanship in the gilded hinges, which fully support the writing table when open and are not only functional but highly decorative. Bonheur du Jour translates to mean ‘daytime delight’, and were hugely fashionable in 18th century France. In a classical or modern residence, this exquisite and compact antique bonheur du jour would look stunning in a bedroom setting or indeed in the bay window of a fine reception room.